In Perfectly Human: Nine Months with Cerian, Sarah C. Williams writes about her daughter Cerian’s brief life inside her womb. During a routine prenatal screening, Sarah and her husband Paul find out that their daughter has skeletal dysplasia, a form of dwarfism specialists say will cause the baby to die at birth. Even though she has the option to terminate the pregnancy up to thirty-eight weeks, Williams decides to carry her to term. They name her Cerian, Welsh for “loved one.” In this book, Sarah shares how she and Paul told their older daughters, how they grieved together as a couple, and how they ultimately decided to do their best to love their daughter for the brief time they had with her. By doing so, Sarah learned not only how to see her daughter as a person loved by God, but also that her own worth is not based on her accomplishments, but on God’s love for her. To be sure, Williams’ story of her baby daughter’s brief life in the womb is sad, but I was surprised by how the book was completely steeped with Christian hope. Cerian died in 2002, so Williams has had many years to pray and reflect on her daughter’s life. It shows in the rich spiritual lessons she is able to impart on the reader. Sarah is not a Catholic, but a Christian with similar convictions about God’s love for each one of us and the dignity of each human person. She shares many stories of how God was present to her and her family during a time that was painful but also full of God’s grace. Cerian’s story could have been told just to be a tear jerker, but instead it was written to share with others the meaning her life brought to her family and help others understand more deeply what it means to be a person. Perfectly Human also touches upon some of the legal and political issues surrounding abortion, personhood, and disability, but not in a preachy or forced way. Sarah’s job as an Oxford professor puts her in contact with many who question her decision not to abort because Cerian’s quality of life would be so poor on the off chance she did live. Williams candidly admits that at the time she was too afraid to challenge their arguments in person, but she uses her knowledge of history and political philosophy to give the readers of Perfectly Human compelling counterarguments. At the end of the book, she also describes how she was able to reach out to a feminist colleague who initially couldn’t understand her choice to carry Cerian to term. This book may be difficult to read for those experiencing an adverse pre-natal diagnosis or the loss of a child, but it could be very helpful for those with a friend or family member going through a similar experience. Sarah shares about both those people who supported her and those who missed the mark in their attempts to encourage her. Particularly helpful is how she expresses the honestly and vulnerability of her relationship with one of her closest friends, Janet, who is pregnant at the same time as her, but with a healthy baby. The book also provides encouragement to those trying to support fathers who have lost a child, as Sarah is always careful to include Paul’s grieving process and how others were able to support him as well. 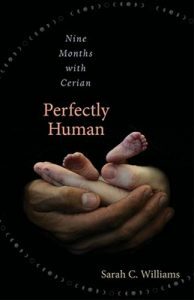 Peaceful, hopeful, and well written, Perfectly Human: Nine Months with Cerian is a wonderful book for anyone who thinks about what it means to be a person, who works to support the lives of unborn children, or who wants to hear a personal story of how God acted in a family’s life. Molly Egilsrud is the Marriage and Family Life, Laity Intern in the Secretariat of Laity, Marriage, Family, Life and Youth at the United States Conference of Catholic Bishops. One family's story of love through difficult times. Find help and support for grieving parents.